As promised, we have developed and launched the “manual” sorting option for Your photos, which was unavailable in Inbox Foto for some time due to technical reasons. Now, when You view the photos of other users, in addition to the standard set of sorting for photos, You can use a new sorting with the title “Mine”. After choosing this type of sorting photos will be arranged in the sequence in which the album owner wants to present them. This can be useful for those who want to present their portfolio or reportage shooting from any location under a certain angle. This option is available for everyone. 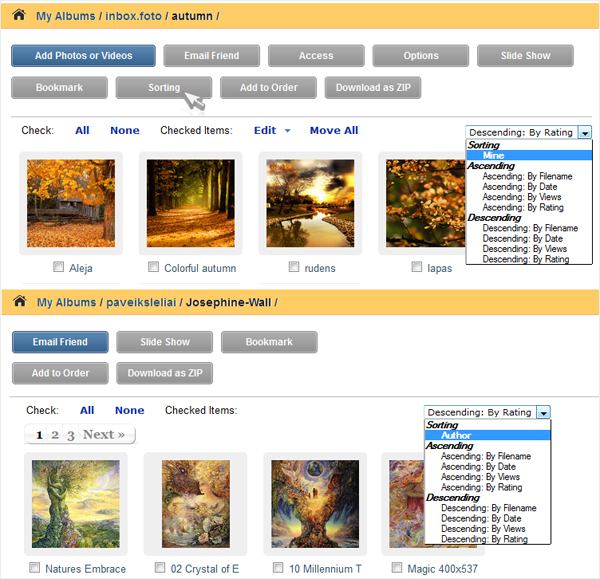 To select manual sorting, open the album and select “Sorting” from the top menu. After clicking on the “Sorting” button, dialog box appears with the photos included in this album. In this window, use Your mouse to drag and put Your photos in order to achieve the necessary arrangement of Your photos. When You’re done, don’t forget to click on the “Save” button, located below the lowest row of photos. You can see the result of your work by selecting “Mine” from the sorting list. In turn, other users will see name of this sorting as the “Author”. That’s all for today, and we hope that we continue to bring You useful and simple improvement in the future.